A sand mandala is a Tibetan Buddhist tradition involving the creation of a spiritual symbol representing a cosmic universe of celestial bodies made from coloured sand. Usually four monks work side by side to create this two-dimensional representation of a three-dimensional ideal universe. In a rare occurrence a group of four Tibetan monks, a doctor trained in the ancient Tibetan healing system, and an astrological professional will visit South Africa on a cultural tour promoting peace and wellbeing. They will construct Sand Mandalas, offer medical consultations and give astrological readings to the general public in Cape Town, Johannesburg and Durban from 26 September to 21 October, 2018. 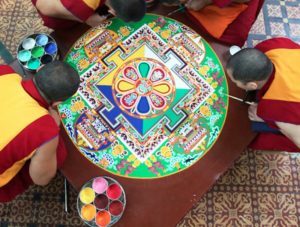 The creation of a sand mandala is a painstaking, time-consuming procedure that is an extraordinary sight to see. 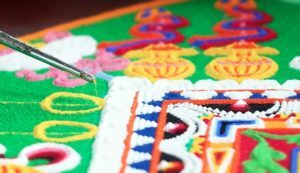 For their South African visit, the monks will construct the sand mandala design of Chenrezig, the Buddha of Compassion, to generate strong compassionate and peaceful energy. 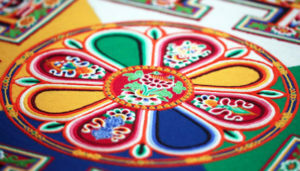 To symbolise the transitory nature of life, the sand mandala is ritualistically destroyed once it has been completed. The Office of Tibet South Africa and the Tibet Society SA have arranged for this group of Tibetan masters to be at the Simon’s Town museum from 26 to 29 September, in Johannesburg at the Wits Origins Centre from 2 to 7 October and in Durban at the Denis Hurley Centre from 15 to 21 October. There will also be special events at Simon’s Town Museum in Court Road. 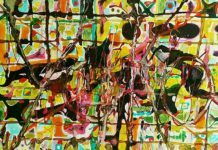 Public viewing 26 to 29 September, 2018, 10am to 4pm daily. There will be an introduction on Tuesday 25 September 2018 at 6pm for 6.30pm with Geshe Lobsang: The Mandala Principle, plus short talks by medical Dr Tenzin and astro-scientist Mrs Lhamo.